Man Stabs Pit Bull To Death Inside Petsmart. 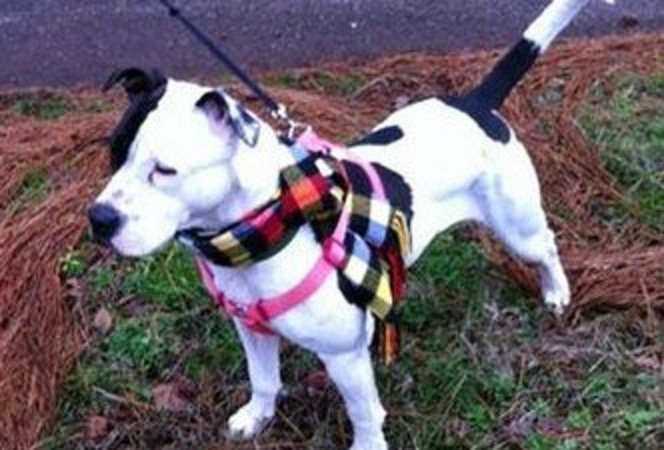 Clara, a pitbull pup, had to be euthanized after she was stabbed multiple times by a customer inside a local Petsmart. Clara was part of an adoption event in Georgia held by the Humane Society. One of the volunteers was walking Clara outside in hopes that someone would see her and want to adopt her. Somehow Clara broke free from the collar and ran back inside the store. It was at that point Clara walked up to a terrier, owned by Greg Emory Haynes, and began sniffing the dog. According to the police report, Clara grabbed the terrier by its ear and began tugging at it. A witness stated that Haynes was yelling for somebody to get the pitbull off of his terrier and kicked Clara several times. Witnesses state that Haynes was yelling, “Get the dog off before I will stab him.” He said it several times. Haynes allegedly used a pocket knife he carried regularly to stab Clara. The witness said he put his hand in Clara’s mouth, and she wasn’t biting the terrier that hard. He was able to pull the pit bull’s mouth open and get the dog separated as Petsmart employees ran over with a spray bottle and air horn. Haynes told police he was only defending his dog like he would his child. He was afraid Clara would turn on him and his eight-year-old child. Police are still investigating, and no charges have been filed.